This little 12 week old seal pup was rescued on 4th February 2010 from Porthcurno, he was suffering from a high temperature, puncture wounds, ulcer to mouth and a damaged left eye. In the hospital �Mad Eye Moody�, as he has been named, was started on a course of antibiotics to fight infection and bring his temperature down. 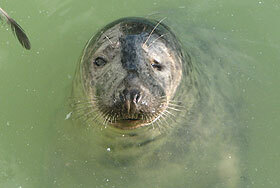 Update: 28th February 2010 - This photo of Mad Eye Moody was taken on 27th February 2010 in the nursery pool number 2. 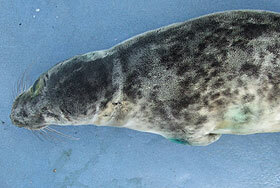 Mad Eye Moody's flipper tag number is 37 (light blue). Update: 22nd March 2010 - Mad Eye Moody is continuing to do well and putting on weight and will not be ready to return to the wild before the Easter holidays. Update: 24th April 2010 - Mad Eye Moody is receiving treatment for his other eye, but is doing well and sharing his pool with Lavender. but at the moment all signs are still good for him to be released later in the year. 21st May 2010 at Gwithian. or make a donation towards a pup's rehabilitation, please click here. Adoptions start from �25.00.